Scoliozis is the 21 century biggest problem. Why? Because most of our jobs consist of an office job. Without working out and straighten the core/ back muscles, the back pain and column problems won't hesitate to appear. For that reason, we recommend you to use a back posture corrector in order to avoid those problems. In combination with constant working out, you will be able to avoid those problems and maintain a straight, healthy back back. Taking down is as easy as dressing the corrector. 30 Day Money Back Guarantee, no questions asked. ✔ Straight Your Back and Correct Your Posture!!! Straigh your column and shoulders posture. Our adjustable velcro back straightener will fix your back problem, and will improve your posture. Re-adjust your trunk and help with stress and tension on lower/ upper back, shoulders, and clavicle. ✔ You Can Take It Everywhere!!! Because the product is compact, you can take it everywhere with you, and maintain your back alignment correctly at all time. ✔ Easy To Use!!! We designed our posture corrector for you to be able to dress and undress it quite easily. Forget about getting help when you are trying to use this product. ✔ Designed For All Sizes!!! 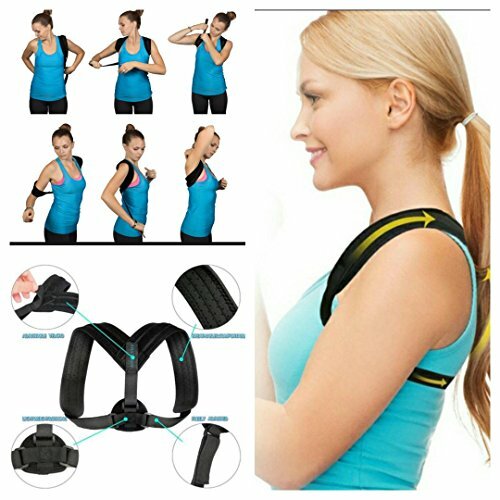 Because we know that not everybody has the same back size, we specially designed our posture corrector to have three inches more of velcro tape. Like that, anyone can use it and will benefit from it. ✔ 100% Risk Free !!! We trust our products so much, that we offer a 30 Day Money Back Guarantee. If you are not satisfied with the product, simply just contact us and we will refund you no questions asked. If you have any questions about this product by ASELLVIO, contact us by completing and submitting the form below. If you are looking for a specif part number, please include it with your message.